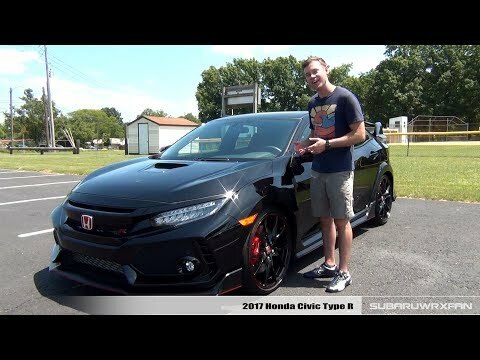 The 2017 Honda Civic Type R boasts a powerful turbocharged 4-cylinder engine, a race-tuned chassis, wildly outrageous styling, and the kind of day-to-day livability that has made the Honda Civic lineup a favorite everywhere. Make no mistake: This is not just a paint-and-stickers special, but a purpose-built and unique addition to the Civic lineup, with unique engine, chassis and interior upgrades. I dislike how some of the parts don't seem to fit properly like the plastic in the rear wheel wells. I wish it had automatic folding mirrors and the sensors that other Civics have. I wish the paint didn't chip so easily. I love how fast and fun to drive it is. Overall, it's the best car I've ever owned. Sporty car which at the same time is easy to drive. I love the car. As it is a sporty vehicle, it is powerful, fast but at the same time easy to and soft to drive. However, the car is really low, so it is sometimes hard to drive through some places. Also, it is not as spacious so it is not suitable for travelling to different places. Does not explode, no hocus pocus. The seats are very comfortable however some mechanisms do not work properly. I love my car because it is reliable and does not ever break down on me or explode randomly or get into accidents I hate my car because it explodes too much too much too much hocus pocus.